Shampooing forms the crux of a hair-care regimen. It is the ideal way to remove grime and dirt from your hair. It also cleans the scalp of all gels, sprays, and smoke. Contrary to popular belief, shampoo doesn't dry out hair. 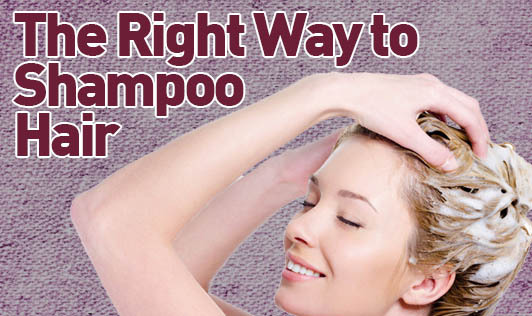 You should shampoo your hair as often as needed. Your ideal shampoo will not cause drying of the scalp or stimulate a greasy scalp. You must also run a comb through your hair before you shampoo it. Then, wet hair with lukewarm water and apply a small quantity of shampoo. Massage gently making small circulating movements with your finger tips. Keep your thumbs at the nape of your neck with your fingers spread out. With the help of your fingertip pads, rotate your fingers applying light pressure on the scalp. Remember your scalp must do the moving and not your fingers. Gradually move your thumbs a little higher, working firmly but gently with your finger tips. Move on to the hair line and remaining area. This is where the dirt and grime tend to be trapped. Take the ends of your hair and rub in the shampoo or soap suds. A single lathering is sufficient for hair shampooed everyday or else you may repeat. Do not pull or tug at your hair while shampooing. A shampoo with high rinsability not only helps to revitalize hair but also leaves the hair clean. The secret of good shampooing lies in thorough rinsing. Rinse as much as you can. Make sure that you don't leave even a negligible amount of residue. Squeaky hair denotes clean hair. If you don't have access to soft water, rinse your hair post-shampooing with apple cider vinegar. Well-rinsed hair has a clear and shiny appearance. Rinsing cannot harm or damage your hair. It only gives your hair better shine and body.